4 bedroom villa with 2 bathrooms & WC. Sleeps 8/9. Private Pool. Great views! The villa has outstandingly beautiful views of countryside and out to sea. It has been recently extended and refurbished throughout. All 4 bedrooms have sliding patio doors onto terraces, three of which are undercover. There is a private swimming pool with terrace and a stone built BBQ and seating area with a fridge, lighting and electricity. The living room has panoramic views through sliding doors on two sides over the valley and out to sea. The upper terrace is reached through the living room and is equipped with a Grand Hall gas BBQ, a hardwood outside table and chairs for 8 and an antique Indonesian hardwood sofa with cushions. There is a utility room downstairs equipped with a second tall fridge/freezer, a washing machine, dryer and sink unit. The downstairs terrace has further seating and another hardwood sofa with cushions. There is plenty of off street parking if required. The villa is situated in Les Teules midway between Santa Cristina and Castell D'Aro - 3 minutes by car. 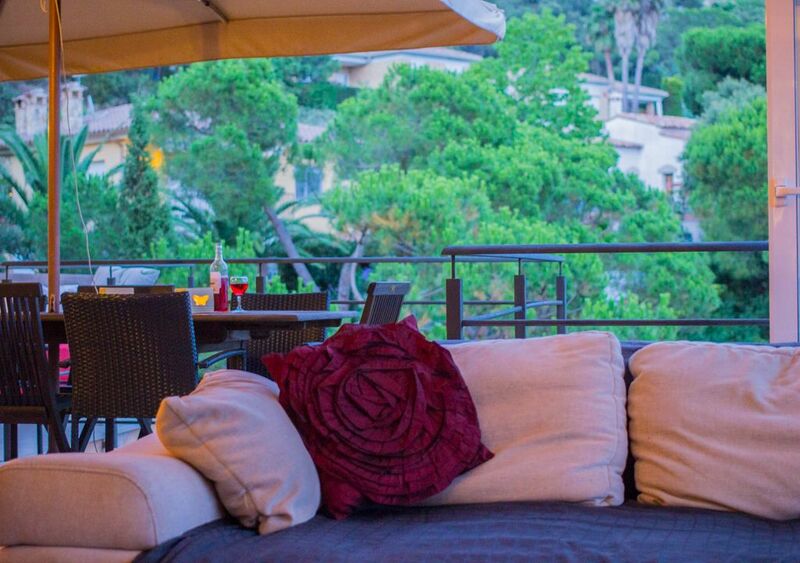 Location: Santa Cristina D'Aro is located in the heart of one of the most spectacularly beautiful areas of Spain, the Costa Brava. There is something for everyone here. You are spoilt for choice of beaches with Sant Pol, Sant Feliu and Playa D'Aro less than 10 minutes away by car and the outstanding beach villages of Calella, La Franc and Timariu less than 25 minutes away. The historic and vibrant city of Barcelona is just over 1 hour away by car or train and the beautiful city of Girona can be reached in less than half an hour. For the active and adventurous there are activities including horse riding, wind surfing, quad biking, paint balling, tennis etc, to name but a few all available locally. Sporting facilities: There are numerous sporting facilities nearby. There is a sports centre opposite the entrance to the urbanisation. The facilities here include, tennis, squash, football, gymnasiums and mini golf. There is also a very good childrens play area and 5 a side football court a few minutes walk from the villa. There are many golf courses nearby, the nearest of which is Golf Costa Brava, in Santa Christina d'Aro. Historical Sights: The beautiful old city of Girona is only a thirty minute drive away. The attractions here include many historical buidlings and the houses that line the River Onyar are a spectacular sight. Barcelona is less than an hour and a half's drive away and can also be reached by train. The attractions here are too numerous to mention but include Gaudi's Sagrada Familia. Figueres with the Dali Museum is approximately an hour's drive away. We are a family who live in Brighton, the bustling city by the sea on the south coast of England. We have been coming to the Costa Brava for many years and like to make as many trips as possible to our very special 'home from home'. Quite simply we love the unique air, light and atmosphere that this part of the Costa Brava has to offer. We came to the area several times to view property with a view to purchase. We could never quite settle on a house which offered accommodation, position & views in equal measure - until we found this house. Here we have the most outstanding views out to the Med, access to some of the most beautiful beaches and bays you will find anywhere in the world and all within a short hop from the UK by plane, or an easy drive through France. Position........... With outstanding countryside & sea views you have the opportunity to enjoy Catalonia, the countryside, it's cities and it's coastline from a base right in the heart of this very special part of the world. A lovely villa in a beautiful area, and a great base for us. We stayed here for my 50th birthday with my wife and kids aged 20 and 23, and we all had a lovely relaxed holiday. We had pre-conceived ideas of the Costa Brava as maybe not our cup of tea, but this is an ideal base for exploring the Costa Brava proper. There are some quite beautiful beaches in the area that are frankly some of the best we have been on. With nice walks and clear blue sea it was very chilled. S'Agaro and Sa'Conca were our favourites. We went to other towns and villages that were well worth the visit, and you need a car to get the most out of the trip. Platja D'aro is 5-10 mins in the car & has a large beach, plus lots of shops, bars & restaurants. Classy town that we used mainly for shopping and going out to eat. Nothing rowdy or tacky in sight ! We also went to Barca just over an hour by train & Girona half an hour by car - both obviously wonderful places of interest. The villa itself has all the amenities that anyone could need, inc nice pool, and when we stayed in, we would have a bbq on the terrace overlooking the hills and sea beyond. Then chill out and watch a bit of telly ! All in all we crammed quite a lot into our trip, but this is a great base to do it from, so that you also feel that you have had a relaxing time. Fully recommend for all the reasons above - enjoy ! Situee en haute coline, dans un quartier residentiel plutot chic avec une superbe vue dur la mer. La proprietee ne manque de rien. Excellent confort et cuisine hyper equipee. Ideale pour 2 familles ou une tres grande famille, Nos enfants se sont amuses dans la piscine quand nous souhaitions une bonne siesta. A quelques kilometres de magnifique petites plages avec de nombreux restaurants. Nous avons passes de superbes vacances et avons decouvert une tres belle region. Recomenderons a famille et amis cette proprietee sans aucun soucis. We visited in September 09, and would certainly take advantage of this marvellous property again. The facilities at the villa are top class, and our children enjoyed the pool immensely! This property is near to a fantastic stretch of coastline, with great beaches and coves, all of which are safe and clean. Fabulous restaurants closeby too, when you've had enough of cooking. Do get out and about and explore this area - you won't be disappointed. We had a great time here. Luxury accommodation, fantastic views and the barbeque/pool area was terrific. Highly recommended by all our family. Brighton UK.